Access your money whenever you need it with your Credit Union Debit Card. Easy access to your funds at thousands of automated teller machines (ATMs) around the world is provided by your Credit Union Debit Card, as well as convenient and safe purchases using the Interac® Direct Payment system. Control over your accounts is never further than your pocket when you carry your Credit Union Debit Card. Your Credit Union Debit Card, together with your personal identification number (PIN) provides access to your Credit Union where ever you are. Together, they are the keys to your financial castle. So make sure you protect them. Click here to learn more about protecting your identity while using your Credit Union Debit Card. Your Credit Union Debit Card puts you in touch with the largest, safest, and most efficient debit network available in Canada- the Interac® Direct Payment (IPD). 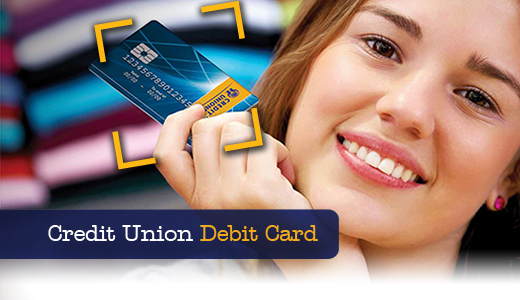 Your Credit Union Debit Card gives you direct access to your accounts. It allows you to pay for purchases at over 708,000 IDP terminals located at over 435,000 merchants displaying the Interac® Direct Payment sign. 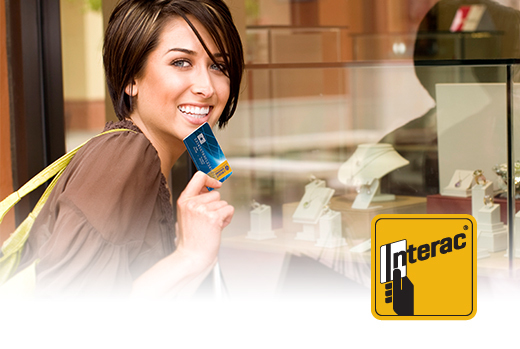 With Interac Flash®, simply hold your Credit Union Debit Card over the debit machine to pay for your purchases. It’s the fastest way to use your Credit Union Debit Card. Learn more about Interac Flash® here. You can use your Credit Union Debit Card for your purchases on the NYCE® Network in the United States, just like at home on the Interac® Network. Learn more about the NYCE® Network here. Your Credit Union Debit Card will work at any Canadian credit union ATM. We call it the Ding Free® Network, a Credit Union ATM network free from network surcharges. You can learn more about the Credit Union ATMs here. Your Credit Union Debit Card is equipped with an embedded microchip that improves the security and minimizes the chance of fraud. Essentially, your Credit Union Debit Card is a microcomputer that communicates with your Credit Union each time you use it to authenticate a transaction. The microchip on the card is inserted into the terminal throughout the entire transaction instead of being swiped one time as with the magnetic strip. The Chip Card communicates with the financial system for verification and authentication during the transaction, ensuring the card and credentials match up . This Chip Card itself can store and process data and sub programs securely, without delaying the transaction process. The data on the Chip Card is extremely difficult to copy or change, minimizing the chance of debit card fraud. Combine Chip Card technology with PIN protection for even better electronic transaction security. Click here to learn how to protect your pin. If you can’t find your Credit Union Debit Card or suspect it has been stolen, contact your nearest Credit Union during regular business hours or 1-800-567-8111 after hours as soon as possible.